Crafting With Craig: "Snow is Falling" A5 Card. Good Afternoon, Well its Friday already. Where has the week gone? Where has the year gone, already into the 2nd week of October. If you haven't already started thinking about Christmas then you should probably start, i have? but i love Christmas so i start thinking about it about May haha. Its been a brill week for me, if you follow me on facebook you will see that i have booked to go to New York. i have wanted to visit New York for near 20 years so this a dream come true. Myself and my mum will be there June next year. What makes it even more special is the i will be there for my 30th birthday. that will be a birthday i will never ever forget for sure. Die Cut snowflake - S57277. Blue tape runner - S56986. Die cut release sheet - S57316. A5 cello bag - S57314. "Handmade by" label - S57261. Centura Pearl - Crafters Companion. Card Blank - Papermill Direct. Wine textured card - DCWV - Die cut with a view. 1- Take your Centura pearl card stock and turn it over. 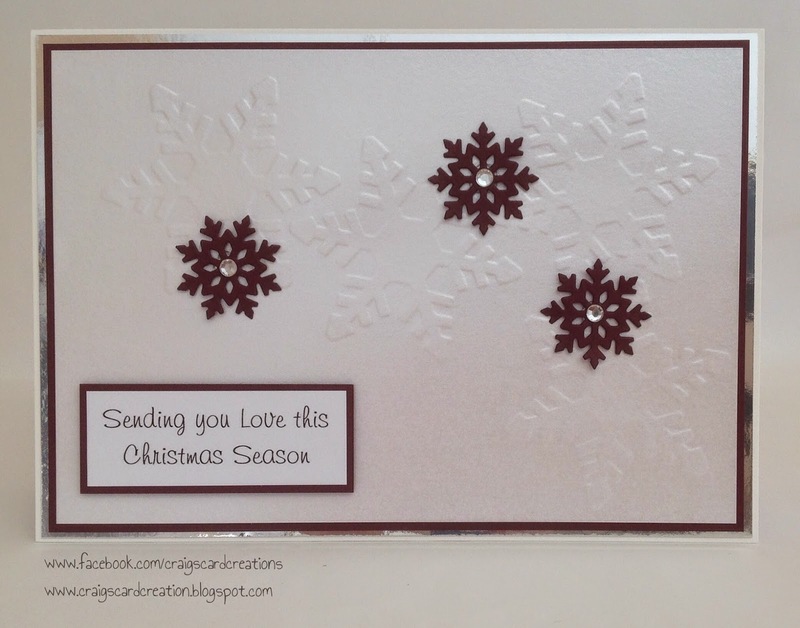 Place 4 of your snowflakes and position them either randomly or in a specific area on the back and tape it down with your stencil tape and run it through your embossing machine. 2- Mat and layer on to your Wine card stock and again onto your silver mirri card. 3- Using your Stencil tape and die cut release sheets, tape your die down on your wine card stock and again, run it through your embossing machine. 4- Again, randomly (or specifically) place your diecut snowflake down using your silicone glue, placing a gem in the centre. 5- Add your chosen sentiment and place your "Handmade by" label on the back and pop it into your Cello bag.